Are you struggling with anxiety, depression and emotional stress? Do you want to learn how to change your patterns of emotional reactivity and intrusive obsessive thinking? Do you want to heal the underlying cause of your emotional suffering? Through Mindfulness-based Therapy you will learn how to totally transform your patterns of reactive thinking that keep you stuck in negative patterns of emotional reactivity. Mindfulness Therapy is quite different to traditional “talk therapy” and counseling. The focus is on teaching you practical tools and methods, including mindfulness meditation, that you can apply yourself to overcome anxiety, depression and other forms of emotional suffering, and this approach really works! Most of my clients and students have already tried talk therapy and counseling, often over many years, but come away feeling that nothing has really changed. Most have also tried anti-anxiety medications and antidepressants also without much lasting benefit. I strongly feel that we have to take a much more practical and focused approach and work on changing the actual psychological process that causes your suffering, which is usually all about habitual identification with emotionally reactive thinking and negative self-beliefs. Mindfulness Therapy is very effective for teaching you how to break free from these habitual patterns of reactive thinking. Mindfulness Therapy provides an immensely effective approach for transforming and healing anxiety and depression and you can expect to see significant improvements after 3-4 sessions. This also makes Mindfulness Therapy extremely cost effective. Online Therapy for Depression – Learn how to overcome reactive thinking and develop better self-confidence and self-esteem. Online Therapy for Anxiety – Mindfulness Therapy is an exceptionally effective treatment for anxiety and Online Therapy for Panic Attacks will teach you how to break free from the debilitating effects of panic attacks. Online Therapy for Driving Anxiety – Many of my clients seek help for driving anxiety and phobias. Mindfulness Therapy provides you with the training and methods needed to successfully overcome driving anxiety. Online Mindfulness Therapy for Social Anxiety Disorder – Undo the habitual patterns of reactive thinking and self-defeating beliefs that feed SAD. Online Therapy for Agoraphobia – Mindfulness Therapy is especially effective for agoraphobia, and provides an excellent option if you cannot leave home. Online Mindfulness Therapy for Phobias – Through Mindfulness-based Image Reprocessing coupled with progressive exposure protocols you will learn how to overcome your phobia. Mindfulness-based Stress Reduction (MBSR) is One of the most popular methods for Stress Management – by neutralizing Habitual Negative Thinking. Online Mindfulness therapy for OCD – overcoming habitual reactive thinking and behaviors. Online Mindfulness Therapy for Anger is very effective for anger management by teaching you how to manage and neutralize anger impulses through mindfulness training. Online Mindfulness Therapy for Insomnia has been shown to be very effective for Overcoming Sleep Anxiety & Insomnia by reducing the agitated thinking & worrying of the racing mind that inhibits the natural sleep response. Online Mindfulness Therapy for PTSD is very effective for recovery from PTSD and for recovery from emotional trauma and abuse by teaching you how to develop mindfulness-based compassion and acceptance, which are essential for healing from trauma. Online Mindfulness Therapy for Addiction can be extremely effective for the treatment of addictions by helping you manage the underlying emotions that cause your addiction as well as teaching you more effective impulse control. Online Marriage Counseling – learn how to overcome conflict and the patterns of emotional reactivity that are so destructive to your personal relationships. Skype Therapy – I offer individual therapy sessions via Skype. It is important that we can see each other. This improves communication and makes the therapeutic process very much more effective. Therapy via Skype is recommended for anxiety and depression where you want to learn how to manage your emotions more effectively. Talk to a Therapist Online – Every one of my clients tells me how much they prefer online therapy to in-person sessions. It is more convenient and also less intimidating. Online Counseling – Counseling is different than psychotherapy with more of a focus on helping you understand what you can do differently to reduce emotional reactivity. Online CBT – Mindfulness Therapy is a near cousin to cognitive-behavioral therapy but with a greater focus on healing at the emotional level since the power of thoughts is highly dependent on the emotional charge of the thought or belief or memory. Welcome! My name is Peter Strong, and I am a professional psychotherapist. I live in Boulder, Colorado, and I offer Skype Therapy. This is a very convenient way of getting help for overcoming anxiety, or depression or any other emotional problems that you may be experiencing. Now, how to overcome anxiety? This is a challenge for many people. The number of people suffering from anxiety is very large indeed, so you are not alone if you are experiencing anxiety and if you are seeking help to overcome your anxiety. You can learn a great deal about how to work with anxiety and how to overcome anxiety and panic attacks by visiting my website – the link is below. The thing that I would like to explain to you today is how we can use mindfulness, Mindfulness Therapy, for overcoming anxiety. Mindfulness Therapy is my specialty, and is what I write about in my book, ‘The Path of Mindfulness Meditation’, and it is a very, very effective way of working with anxiety disorders of all kinds. The major issue that people experience when they are suffering from anxiety is this habitual tendency to become identified with thoughts and emotions. Thoughts and emotions arise due to conditions, it’s just part of our conditioning, and anxiety thoughts and anxiety emotions are no different. We learn these particular patterns of responding, reacting, to situations whether externally or to stimuli coming internally in the form of thoughts and memories. Now, just because a thought or memory arise in the mind does not mean that we have to become anxious. that is the result of this process of identification, where we literally become the thought or emotion or memory that arises. Now, a large part of Mindfulness Therapy is learning how to break this habit of becoming, this habit of reactive identification with thoughts and emotions. Because, if you can stop the process of becoming identified with the contents of your mind, then you stop feeding the anxiety reactivity itself. And, if you don’t feed the anxiety, it will begin to change, also by itself. The main problem is reactivity, and mindfulness is perhaps the most skillful therapeutic method there is for learning how to break this cycle of reactivity, by developing awareness and by developing compassion. Compassion, of course, is the greatest healing force for mental suffering. So, if you would like to learn more about Mindfulness Therapy, which I offer Online via Skype, please visit my website and CONTACT ME! Thank you! Free Your Heart and Spirit; break free from the chains of anxiety and depression; live life as it is meant to be enjoyed to the full! Mindfulness Therapy teaches you HOW to do this! What is mindfulness and why are so many psychotherapists and counselors now incorporating mindfulness into their therapy practices? There is no doubt that mindfulness has become a buzz word that is attracting considerable interest, especially after the tremendous success of the Mindfulness Based Stress Reduction (MBSR) and Mindfulness Based Cognitive Therapy (MBCT) developed by Jon Kabat-Zinn and others (http://www.youtube.com/channel/HCRj1DL01onHA). Such mindfulness-based programs have now become the method of choice for effective stress management and are having a major effect on how we approach psychotherapy and the management of anxiety and depression. Of course, mindfulness was central to the Buddha’s path of enlightenment and awakening, so the practice of mindfulness has been around for a very long time. Today we are gaining a new appreciation of the remarkable place that mindfulness has in our own lives as a tool for healing the mental afflictions that assail us and the conflict and violence endemic in our world. Now, more than ever, people from around the world are re-investigating this ancient state of consciousness that has remained central to Buddhist Psychotherapy. Mindfulness is learning to see our emotion and thought without becoming reactive. Mindfulness Therapy teaches you HOW to do this. Mindfulness itself is a remarkably simple form of deliberate, focused awareness, and this is perhaps the most common understanding of what mindfulness is. It is learning to see what we usually take for granted, and in particular, to see our habitual thought reactions and emotional reactions as they arise. Mindfulness begins when we develop the quality called vigilance, watchfulness and acuity of perception. We are creatures of habit, and it is our habits, which operate outside of our conscious awareness, that create most of our suffering and unskillful behaviors. But, mindfulness is much richer that simple attention. Paying attention and staying aware is the beginning of mindfulness, but only the beginning. It is important to appreciate that mindfulness is multi-dimensional and incorporates many different qualities of conscious awareness, which I will attempt to outline below. The working definition that I like, to describe mindfulness (called sati in Pali, the ancient language of the Buddhist texts) is non-reactive awareness. This means that we are able to be consciously aware of something, an object, a thought, an emotion, a memory without reacting to the object we see with further thinking or emotional reactivity or behavior. We learn to see a thought as just a thought; an emotion as just an emotion; a person as just a person, without labeling, judging, classifying, analyzing or becoming lost in any secondary thinking, without reacting to the object. We simply hold the object (internal or external) in our awareness, and mindfulness practice feels very much like a mother holding her sleeping baby in her arms; there is that sense of complete attention to reality as it is without becoming lost in thinking, emotional or reactive behavior. Mindfulness is often described as sustained observation; becoming the observer, rather like a scientist observes with a degree of detachment the object of his or her study. Certainly, this quality of attention to detail and not staying stuck in our subjective reactions to things is a vital component of mindfulness, but it would be wrong to reduce mindfulness to the clinical form of observation that is a common (and wrong) view of scientific observation. Mindfulness practice does not involve clipboards and white lab coats! Rather, there is the sense of really tuning in to whatever you are focusing on, of valuing the object of your attention, rather like the mother, again, who is present with her baby in a very much more human and engaged way that could not be adequately described by terms like “objective attention” and “scientific observation.” Mindfulness is much more alive, dynamic and responsive than this. For this reason, I coined the term engaged-presence to add to our growing understanding of what mindfulness is. But, there is more! As we become less reactive, we become more present for our thoughts and emotions; or for external experiences and for people too. The more present we are, the more we see and experience whatever we are looking at. We come to not just see the object, but to care for what we see, quite naturally as a product of seeing more deeply into the reality (the truth) of what is there. As mindfulness evolves, we become more connected with what we see, and out of this greater sense of connection, we become more positive and compassionate toward what we see. This sense of positive connection is described by the term metta, loving-kindness, friendliness; a sense of “I care about this object that I am experiencing.” Out of this property of mindfulness compassion flows quite naturally. The simple analogy here is that it is easy to kill someone who you have never met and labelled ‘enemy’ but very difficult in deed to kill someone who you know in-depth. So, mindfulness encompasses vigilance, non-reactivity, engaged-presence and friendliness. That’s a good place to start on the path of cultivating our understanding of what mindfulness really is, and the deeper the understanding, the more powerful mindfulness will be in transforming the quality of our life. You might like to watch videos of Ekhart Tolle who talks in a very engaging way about mindfulness and the power of living in the present: http://www.youtube.com/user/EckhartTeachings. I also recommend the teachings by Tara Brach (http://www.youtube.com/user/tarabrach). Mindfulness Therapy is a form of Cognitive Therapy that employs the ancient awareness skill called mindfulness originally taught by the Buddha, 2600 years ago. Those teachings are just as relevant today as they were back then. It is recognized that the central problem that keeps us suffering with anxiety, depression and stress is blind habitual reactivity. We are besieged with negative thoughts and emotions that repeat over and over again like a broken record player. Mindfulness Therapy teaches us how to recognize these patterns of negative thinking and effectively stop them, not through willpower, which is seldom very effective, but through changing the way that we relate to our thoughts, emotions, memories and beliefs from a relationship based on reactivity to a relationship based on awareness and non-reactivity – mindfulness. Gradually, we train ourselves to become far less reactive and far more responsive. This is what leads to healing and transformation in our self and in our relationships as well, and this is the focus of this Online Counseling Service. The central theme in all mindfulness work is to learn how to establish a relationship with your emotions that is NOT reactive. You learn how to be with your feelings without becoming overwhelmed by them and without becoming lost in the story, the habitual reactive thinking that simply feeds the problem. This is called the Protective Function of mindfulness – it protects you from becoming a victim of your emotions. When you have established the right, non-reactive, relationship with your emotions, then you are creating the ideal conditions in which the emotion can heal itself. This is called the Transformational Function of mindfulness. During the whole process of developing more mindfulness you begin to break free from negative cognitive, behavioral and emotional habits and you gain more emotional and spiritual freedom. This is called the Liberating Function of mindfulness – you become more empowered and you begin to discover your True Self – the authentic YOU that is alive and passionate, full of intelligence and wisdom and, most importantly, compassion. Your happiness is directly related to how well-aligned you are with your True Self, and the happiness of your relationships with others and with the world flows naturally from this inner alignment. You become less reactive and more responsive in everything you do. The interest in the application of mindfulness for treating anxiety and depression and stress has grown exponentially over the last 10 years. One good site for regular updates on the latest research studies on the effectiveness of mindfulness is The Mindfulness Research Guide. Acceptance of our inner emotional pain is an important, actually, essential requirement for transformation and healing. Resistance and Aversion are our greatest enemies along with Avoidance, or not being willing to face our difficult emotions. However, it is important that we understand what acceptance is, because blind acceptance is simply another subtle way of not facing our emotions. Blind acceptance is another form of mental reactivity, and like all forms of habitual reactivity, it simply feeds the problem and inhibits the change process required for healing to occur. There are two forms of acceptance: Static Acceptance and Dynamic Acceptance. The first kind is reactive and related to resignation and apathy, believing that nothing can change so I better get used to the fact. This is based on the most basic form of mental reactivity which is Identification. We take the emotional pain as solid and unchanging and we identify with it as an absolute object, not realizing that an emotion, a traumatic memory, a fear or anxiety is never absolute, but actually a relative and superficial representation of a changing process. It is destined to change and resolve itself, but our identification reaction actually prevents the emotion from changing and healing. Mindfulness is a form of Dynamic Acceptance and helps us align with the ultimate reality of an emotion, like any other mental object, which is that it is a dynamic process and is destined to change and heal – if we allow it the space in which to change and heal. This is what we cultivate during Mindfulness Therapy. As the saying goes, it is what you don’t see that controls you. This refers to those habitual patterns of negative self-talk and emotional reactions that operate automatically, out of our control. We simply don’t see what is going on. We become victims of our reactive habits – and this is what we seek to change through the well-tested methods of Mindfulness Therapy, which is what I teach during Online Counseling sessions. The first step to stopping these habitual negative reactions is to become aware of them, to awaken to them, which is what mindfulness training is all about. The simple fact is that the more aware you become of your habitual impulses the more chance you have to change things. Awareness puts you back in control, something that can never happen as long as you remain blind to what is going on. Knowledge is power: The more you see of your patterns of mental reactivity the less power they will have over you. The second step that we teach during mindfulness counseling online is to cultivate a stable and positive relationship toward the underlying emotions that power the reactive habits and beliefs. Our habit is to ignore our suffering or even repress it, but this only reinforces the habit and allows it to grow stronger. Ignorance is not an answer. Similarly, resistance or fighting our painful negative emotions and trying to make them go away is equally ineffective. Aversion is more likely to make our suffering worse and make the underlying emotions stronger. Ignorance and resistance simply feed the emotions, like throwing wood on a fire. In fact, any form of reactivity makes things worse. The general principle here is that reactivity inhibits healing and the resolution of emotional suffering. Mindfulness, which by definition is the exact opposite of reactivity – non-reactive awareness – naturally promotes healing and resolution, and this is what we cultivate during Mindfulness Therapy. The third step of Mindfulness Therapy is called the Resolution Phase, and this results from cultivating the right kind of relationship, based on openness, acceptance and friendliness with our anxiety, traumatic memory, stress or other painful emotions. When you get this relationship right, which is what we teach during Mindfulness Therapy, then the painful emotion will begin a process of spontaneous transformation that leads to its resolution. Talk to an online therapist for effective help with anxiety, depression, stress and for addiction counseling online. Watch this video and then CONTACT ME to schedule an online therapy session. Welcome! My name is Peter Strong, and I am a professional online therapist offering online therapy over Skype for help with anxiety, depression, panic attacks, agoraphobia and other emotional problems that you may be struggling with. Online therapy is an excellent option for most people who simply need to learn better ways of working with emotions, and over the years I have developed a very effective way of working with emotions using mindfulness, and the techniques that I teach online during these online therapy sessions is called Mindfulness Therapy, and this is a specific way of working with your emotions using mindfulness. The first is learning how to form what we call a Mindfulness-Based Relationship with your emotions, with your thoughts and other mental content that cause suffering. The most import ant thing that we need to learn is how to sit with these emotions or negative thoughts or painful memories without becoming overwhelmed by them, without becoming reactive. So, the first step in Mindfulness Therapy is learning how to be with your emotions without becoming consumed by them, without becoming reactive. So, that’s called establishing relationship with your emotions. The second phase of Mindfulness Therapy involves investigating the structure of your emotions – what actually happens internally in the mind, how you see your emotions, negative thoughts or memories. Typically, the way we see emotions is in the form of imagery. There is an internal picture which creates that feeling of the emotion or memory or trauma or negative thought. It’s how we see it internally that actually produces the emotional suffering. Seeing this allows us to change the imagery, and by changing the imagery you are able to change the emotion. So, the third phase of Mindfulness Therapy is changing the internal structure of our emotions and thoughts. This is called Resolution. If you would like to learn more about online therapy and working with an online therapist and if you would like to learn more about Mindfulness Therapy in general, do visit my website, CounselingTherapyOnline.com, and send me an email, and I will be happy to answer your questions, and when you are ready, we can schedule an online mindfulness therapy session via Skype. This service is available wherever you live. All you need is Skype, and PayPal, of course, for making secure online payments after completion of each session, and a good internet connection. If you have these three things then you are ready to start online therapy. So, please visit my website and email me. Thank you! Online Therapy is very convenient and effective! Skype therapy service for anxiety and depression. My name is Peter Strong and I provide online mindfulness therapy for treating anxiety, for treating generalized anxiety disorder, panic attacks, excessive worrying, social anxiety disorder, agoraphobia, and many other anxiety disorders. The mindfulness approach is immensely effective for helping you break the habits of identification with thoughts and with emotions. All anxiety is produced by reactive psychological processes that fuel the emotion of anxiety itself. So reactive thinking will fuel the anxiety, or other forms of emotional reactivity will also fuel the anxiety. Reactive behaviors such as addiction can also fuel anxiety. So, the key here is that anxiety is fueled by habitual processes of which we are not conscious and the purpose of mindfulness training is to make them conscious, because when you make a habit conscious you basically neutralize that habit, you can neutralize the reactive thinking the feeds the and anxiety or panic attacks. And that’s the first part of mindfulness therapy, is learning how to neutralize these psychological habits that feeds the anxiety. When you do that then the anxiety will continue its own natural process of healing, of resolution, and you can also help in resolving itself and basically changing and transforming itself, also by establishing a mindfulness relationship with the anxiety emotion itself. We do this through mindfulness meditation on our emotions. In that way we can actually help the emotions heal and change. If you would like to learn more about working with me as an online mindfulness therapist, do please go to my website and then email me. Let’s schedule a trial mindfulness therapy session over Skype. Then you can see for yourself the immense power of using mindfulness for treating anxiety and also depression. Thank you. Mindfulness Therapy is one of the most effective approaches available for teaching you how to successfully manage and resolve long-standing patterns of anxiety and depression. Online Mindfulness Therapy via Skype is a convenient and very popular world-wide service provided by US psychotherapist, Dr Peter Strong. Today, working with an online therapist is becoming the first choice for learning how to overcome anxiety, panic attacks, depression and stress. In this introduction we learn how Mindfulness Therapy online works for healing Anxiety and anxiety disorders. Mindfulness Therapy is becoming one of the most respected methods for treating anxiety and for managing anxiety symptoms. This gentle yet extremely powerful therapy is also very suitable for online therapy, especially when we use Skype, which allows the client to have a face-to-face session with an online therapist. Convenience and comfort are two of the most common reasons why people choose online therapy, but many really like the approach of Mindfulness Therapy, which tends to focus on changing the underlying causes of your anxiety, rather than just treating the symptoms. many people see big changes after only a few sessions of mindfulness-based online therapy. If you are contemplating online counseling therapy to help you better cope with your anxiety, please visit my website and email me. The Boulder Center for Mindfulness Therapy Online with Dr. Peter Strong. Skype-Based Online Mindfulness-based CBT Psychotherapy for Anxiety & Depression, Traumatic Stress and PTSD, Addictions, Emotional Abuse Recovery and other Emotional Problems: A convenient and effective Online Counseling Service that you can access from home. Mindfulness has attracted considerable attention throughout the healing professions and it has become an essential tool for treating anxiety and depression. Essentially mindfulness helps us establish a conscious relationship with our inner emotions in which we are not reactive, but fully present. This creates a safe therapeutic space that allows emotions to heal themselves as well as deconditioning the habitual patterns of negative thinking that sustains anxiety, depression and trauma. Mindfulness Therapy has developed this approach to a fine art. Mindfulness is a form of conscious awareness in which we are fully aware of experience as it is unfolding. This may not seem different to our usual understanding of awareness, so in order to better understand mindful-awareness we need to first examine common awareness. When we encounter an experience, which could be external, such as a sight, sound, or touch, or internal, such a thoughts, memory or emotion, the mind tends to react to the experience according to past conditioning. When we look at a tree, we don’t just see the tree as it is, but see a composite of the objective reality of the tree combined with our subjective reality, our internal representation of the tree. We see the products of our subjective reactions to the tree, and often this dominates our perception and awareness so much that we see very little of the truth of what is in front of us. We can describe consciousness as a continuum between the totally objective truth at one end and the completely subjective reactivity at the other. Many of us reside more on the subjective side than the objective side and our experience is dominated by subjective habitual reactivity that has the effect of blinding us to reality. Mindfulness is the conscious attempt to correct this imbalance and minimize subjective habitual reactivity and shift consciousness towards objective perception. Hence mindfulness is often described as the direct awareness or bare attention to present experience. It is non-reactive awareness that allows us to completely experience any object of consciousness. One of the favorite terms that I use to describe mindfulness to clients is presence. Mindfulness teaches us to be fully present for our experience as it is, rather than thinking about what we are experiencing, analyzing our experience, or reacting with attraction or aversion to what we are experiencing. Mindfulness is a hallmark of the Buddha’s teachings and he considered mindfulness as the necessary foundation for inner transformation, as well as the purification of the actions of body, speech and mind as outlined in the Noble Eightfold Path. A person cannot perfect morality, compassion or right action, without first developing mindfulness, because mindfulness is the vehicle for seeing the reality and truth of things as they are, rather than distorted by our prejudices and beliefs. In relation to the mind, the Buddha made it very clear that if you want to transform inner emotional suffering, you must open your mind’s eye and look inside to see what’s there. Reactivity and thinking take you away from this primary and direct perception, because when you react, you experience the reaction, not the original object. When you think about your anxiety or trauma, you are experiencing thinking about the object, which is not the same as the original emotion. Reactivity takes you away from being present and this is actually a subtle form of suppression, and when the mind remains ignorant through suppression of any kind, it is prevented from changing. The first requirement for transforming anxiety is to allow yourself to observe it fully, to be completely present and aware of the emotion. Without this effort to overcome unawareness, nothing can change. In fact, the unawareness is an essential factor that creates the anxiety in the first place. This is particularly the case for depression, where there is a complex superstructure of negative reactive thinking around the core emotion or trauma. Therefore, the first characteristic or dimension of the mental factor called mindfulness is the active watchful component, called RECOGNITION or VILGILANCE. We train ourselves to recognize each and every movement of reactivity in the mind so that we can stop its proliferation and return to being mindfully aware of the core emotions. However, mindfulness is multi-dimensional. It is not simply learning to be more aware, but of continuing from basic awareness to a relationship of complete presence, in which you look and listen with a clear, still mind. The second dimension of mindfulness is about how you relate to the core emotion, or any other experience that you are observing. Mindfulness is like a spotlight and illuminates the emotion and directs your attention to the emotion and stops it being distracted away from the emotion. Now, we need to continue to shine the light on the emotion and begin the process of mindful-investigation. Mindfulness allows us to build a relationship with our inner emotional complexes that is spacious, non-threatening and safe. We are so used to reacting, that we never actually spend any quality time with our emotions. It is like the busy friend who never seems to have time to have coffee with you. “Sorry, can’t stop now. Catch you later.” This is what we do with our emotional suffering all the time; we don’t take the time to simply be present with our inner pain, and it is hardly surprising that the pain persists. Mindfulness is all about making time to be with your emotion, literally sitting with it as you would with a friend, and listening. Hence the second dimension of mindfulness is RELATIONSHIP and PRESENCE. We all know how important it is to be fully present with your spouse or friend when they are suffering. They need your presence more than advice or words. The third dimension of mindfulness emerges quite naturally after you have established mindful-presence and this is INVESTIGATION. When we investigate an emotion like anxiety or depression with mindfulness, it responds by differentiating into more subtle feelings, memories and inner imagery. We simply see more, and this is very important, because it is in the details of what we see that transformation becomes a possibility. Just like a car that won’t start, the best response is to open the hood and look inside the engine. Solutions present themselves. If you see a loose wire, the solution is simple; but you had to look inside first or you would never have discovered the solution. We tend to stay stuck at the superficial outward appearance of our emotions; we take our anxiety or depression to be solid entities, when in fact they are never solid and never what they first appear to be. An emotion is a construct, like a fortress, and mindfulness is the process of taking apart the bricks and mortar. When you begin to disassemble the emotion, then the solutions begin to present themselves quite spontaneously. Hence, there is a fourth dimension to mindfulness, a TRANSFORMATIONAL domain. First we learn not to react; then we learn to be present. When we are present, we begin to discover the inner structure of the emotion, and this paves the way for transformation. Actually, each of these preliminary dimensions of mindfulness is transformational; overcoming reactivity and learning to relate to inner pain is the hallmark of successful psychotherapy. However, making the inner structure of our depression conscious will directly lead to the transformation at the core level. The psyche has a remarkable ability to heal itself if given the freedom to change and this freedom is provided by mindfulness. We all have an innate inner wisdom-intelligence, called satipanna in Buddhism, which directs change from instability to stability; from discord to harmony; from suffering to well-being. This natural intelligence is just like the wisdom of the body, called homeostasis, which continually makes adjustments to maintain health. The psyche is also guided by psychological homeostasis towards well-being and happiness. When mindfulness is established, we create the ideal conditions of inner freedom in which this natural intelligence will direct the process of inner transformation. Many of my clients discover the intuitive resolution to their depression, anxiety and post-traumatic stress through learning to listen inside with mindfulness and allow the psyche to heal itself. The mechanism for this innate transformation frequently involves experiential imagery, which will have to be the subject of another article. You can also read more about this on my website. You are not your thoughts, emotions, beliefs, memories. Your True Self is always greater than the content of your mind, the Little Self. When you really look closely at anxiety, depression, fear, anger or stress, you will almost always find recurring patterns of negative thoughts, traumatic memories and habitual emotional reactions. They are our tormentors, the pesky biting insects that annoy us throughout the day. They ambush our consciousness, pull us down and cause stress and emotional suffering. They come uninvited, cause havoc, and we wish that they would go away. If only we could control them, we would certainly have a better chance of controlling our mental state. So how do we do this? The practice of mindfulness and mindfulness meditation can provide a path forward. The first step of mindfulness practice, and one that can make all the difference, is to fully and completely understand that YOU ARE NOT YOUR THOUGHTS. Thoughts, emotions, in fact any mental content that arises are simply products of conditioning; YOU are much more than this. It is like the ocean and the fish that swim in the ocean. The ocean is not the same as the fish that live in it, and cannot be equated with the contents. The essence of the ocean is as the space that contains these things, not its contents. The same applies to the mind. The essence of the mind is as a container of experience, the ground in which mental objects, thoughts, emotions, beliefs, perceptions and memories can exist. When you realize this, that you are so much more than your thoughts and emotions, then you are well on the way to gaining your freedom and independence from the pesky flies that cause so much stress and suffering. At the end of the day you have a simple choice to make: Do you want to be the ocean in all its vastness and glory, or do you want to be a fish, flapping around in a state of agitation and fear? Learning to be the ocean is a wise choice, and this is something that can be achieved through the practice of mindfulness. The trick is to learn to see mental objects as just that, objects, not you, that arise, do their dance and then pass away. Anxiety arises, and what is our usual response? We are ambushed by the emotion and we become the emotion. We become an anxiety-fish! Fear arises and we are seduced into becoming afraid, a fear-fish. Anger arises and we become angry-fish. No choice, no freedom, lots of suffering. With the practice of mindfulness, we begin to get wise, and become more engaged with what is going on in our minds. Mindfulness helps us tune in to this cycle of habitual emotional reactivity. Instead of blindly accepting our impulses to become anxious, to become afraid, to become fish, we learn to actively engage with these reactions. When anxiety thoughts arise, we respond with, “I see you, anxious thought. I welcome you, I will make a space for you to do your dance, I will listen to you with care and attention…but I will NOT become you.” You can learn to mindfully greet each emotion, each negative thought, as a visitor who has come to stay for a while, just like visitors in your home. Invite them in, offer them tea and sit with them for a while. You may not like your visitors, but you know the importance of being kind, courteous and hospitable. You cannot get rid of your negative emotions, your depression and fear by force, which is our usual reaction. We don’t want to feel our anger or fear; we want to fix them so they won’t bother us. But, here’s the thing. You can’t. Why not? Because you created them. Its like asking a wolf to guard the farmer’s chickens. A system that is broken cannot fix itself. What is needed is something altogether more creative, and this is the second step of the practice of mindfulness: Actively turn towards your suffering and work on creating a safe relationship with your fish. When you are mindful, you are by definition not being reactive. The effect of this is to create a space around the emotion. The more mindful you are, the greater the space. The more space there is, the more freedom. Freedom from what? Freedom from the grip of the negative emotion, thought or belief. There is a Zen proverb: What is the best way to control a mad bull? Answer: Place it in a very large field. If there is plenty of space, then the mad bull, or your anxiety, hurt, trauma or depression cannot harm you. Also, what is equally important is that the mad bull can’t hurt itself. This is very important, because both of you need the space in which to heal. Mindfulness creates therapeutic space in which emotional knots can move, unwind, unfold, soften and become workable. And, what is most remarkable, if you create lots of space around your suffering, the suffering has a chance to transform and heal itself. Its not what you do that matters so much as creating this transformational therapeutic space and allowing emotions to change themselves from the inside out. In my work as a psychotherapist, I never cease to be amazed at how effective mindfulness can be when used correctly. The moment when a client stops running away and turns towards his or her suffering with kindness, full attention and engaged presence, things start to change in a beneficial direction. The healing comes from the quality of the relationship that we have with our pain. It’s not about trying to fix things, trying to replace negative thoughts with positive thoughts – it’s all about presence. With this quality of listening, based on genuine openness and gentleness, the relationship of mindfulness, solutions appear quite naturally. 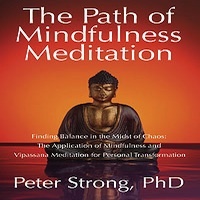 Peter Strong, PhD is a Professional psychotherapist and Online Therapist, teacher and author based in Boulder, Colorado, who specializes in the study of mindfulness and its application in Mindfulness Psychotherapy for healing the root causes of anxiety and depression. Besides face-to-face therapy sessions, Dr Strong offers Online Counseling Therapy through live Skype video sessions. Schedule an appointment. Email inquiries welcome. You can purchase a copy of Dr Strong’s book ‘The Path of Mindfulness Meditation’ through Amazon.com, Amazon.ca and Amazon.co.uk and Barnes&Noble.com. Online Mindfulness Therapy provides a very effective way of transforming difficult emotions, including anxiety, depression and compulsive-obsessive thinking and addictions. Mindfulness Therapy focuses on changing the underlying process that causes emotional suffering rather than just treating the symptoms through medications or traditional talk therapy. Welcome! My name is Peter Strong and I am a professional online therapist. I offer online therapy via Skype. The style of therapy that I offer online is called Mindfulness Therapy, which is a modern form of therapy combining Cognitive Therapy and mindfulness. This is very effective, indeed, for working with anxiety, panic attacks, agoraphobia, social anxiety, depression and also for working with compulsive emotions and addictions. I would like to talk to you a little bit about working with anxiety today, because this is a very, very common problem and it’s actually easier than you might think to overcome anxiety. Basically, the strategy is to learn how to form a relationship with your anxiety based on awareness and friendship (that by-the-way is the definition of mindfulness): Awareness plus Friendship. When you can form a relationship with your emotions you begin to break the habit of reactivity, and it is emotional and cognitive reactivity that feeds the underlying anxiety. So, this is a very important strategy that I teach during these Skype Therapy sessions. Most people see very fast results with this approach because it’s very direct and works on changing the underlying process. So, if you would like to schedule a session with me, please contact me and we will discuss whether online mindfulness therapy is the right choice for you. Are you struggling with anxiety, depression and stress or addictions, or relationship conflict? Mindfulness Coaching will give you the skills you need to work with difficult emotions and to break free from those patterns of negative emotional reactions that keep us stuck. Welcome! My name is Peter Strong and I am a professional online therapist, living in Boulder, Colorado, and I offer Mindfulness Coaching for helping you work with difficult emotions, with anxiety, depression, stress, anger or addictions; wherever you feel caught by emotional reactivity. Mindfulness is an extremely powerful way of working with emotions and working with emotional habits in general. I describe mindfulness in my book, ‘The Path of Mindfulness Meditation’ as ‘engaged-presence.’ This has a very special meaning: It means that we choose to engage with our emotions or our reactive thoughts, including painful or negative thoughts, with mindfulness. Mindfulness is a form of awareness that is non-reactive, non-judgmental. It’s about learning to be present with the contents of your mind without becoming reactive. Becoming present with full awareness and a quality of compassion that, in the Buddhist tradition, is called ‘metta,’ meaning loving-kindness or a form of loving-presence; the kind of relationship that a mother would have for her baby. It’s a state of being totally tuned-in to the baby’s needs with an open mind and an open heart. This is what makes mindfulness quite different than plain attention or awareness. So, I often give the equation that Mindfulness is Awareness plus Metta, or Awareness plus Compassion. When we bring this quality of positive and non-reactive awareness to an emotion that’s in pain within us, such as anxiety or depression, that allows the emotion to change, to heal, and to transform, to resolve itself. So, when we are learning to work with emotions using mindfulness during the mindfulness coaching sessions that I offer online via Skype, I will teach you how to literally sit with your emotions, establishing a relationship with them in a way that helps them heal and also, of course, in a way that protects you from becoming caught-up in the habitual reactivity that creates so much of our suffering. So, if you would like to learn more about Mindful Coaching online via Skype, please visit my website and email me through the contact form on the website. Ask your questions, and if you would like to go ahead, we can schedule a session of Mindful Coaching for you. Thank you! It is very easy to get started with Mindfulness Therapy Online via Skype. All you need is Skype and PayPal accounts, which are both free and very easy to set up. People really enjoy the mindfulness approach and the skills that I teach in each session are very effective for reducing the symptoms and the underlying causes of anxiety, depression and stress. Please contact me and let’s explore together how I can help you through Online Mindfulness Therapy. Peter Strong, PhD is a Professional Psychotherapist, Online Therapist, Spiritual Teacher and Author, based in Boulder, Colorado. Peter developed a system of psychotherapy called Mindfulness Therapy for healing the root cause of Anxiety, Panic Attacks, Depression, Traumatic Stress and Emotional Suffering. Peter Strong, PhD - Professional Online Mindfulness Therapist, Boulder, Colorado. If you are serious about overcoming anxiety, depression, OCD, addiction, PTSD, anger, insomnia and other forms of emotional suffering, you must heal the underlying cause. That is the primary focus in Mindfulness Therapy. Mindfulness Therapy describes a unique and very effective approach that I developed 20 years ago and which focuses on teaching you how to apply mindfulness to aid your recovery from anxiety, depression, addiction and emotional trauma without medications or psychoanalysis. SCHEDULE A SKYPE THERAPY SESSION WITH ME NOW! Tell me more about yourself and how I can help you. Tell me what you have tried to date. Tell me what days and times work for you. Please confirm that you have Skype and PayPal. I will reply to your email within 24 hrs. Please also reply to my emails promptly. I also offer a sliding scale for people who cannot afford my standard fee. Contact me to discuss this further. I will always try to work with what you can afford. Special rates for veterans and first responders. SLIDING SCALE FEES $55 – $95 / hr. Read my book! Available through Amazon. I provide online mindfulness therapy to help manage anxiety, depression and other emotional problems. I do not provide medical treatment online. For the treatment of a medical condition you should consult a medical doctor. I do not provide crisis counseling. If you are at risk of committing harm to self or others you should contact an appropriate emergency service. I do not accept medical insurance plans. Skype therapy and online therapy is not usually covered by insurance. I work with adults only. You have a right to confidentiality and I respect all communications as confidential unless you present a risk of committing harm to self or others. You may ask any questions you wish about my credentials, my methods and my experience, and about what to expect from online therapy sessions with me. You have a right to cancel any time during the first session without incurring a fee. After that you are expected to pay immediately after completion of a session. Online Mindfulness Therapy Create a free website or blog at WordPress.com.